Meets and exceeds California Bureau of Automotive Repair, BAR-90 and BAR-97 ASM approval requirements. Performs State specified, software-controlled automated emissions testing sequence with computer determined pass/fail results. Interfaces to Sun Electric dynamometer systems for ASM. Automatic calibrations, system leak check, zero/span and system status verification. So you've received your DMV renewal notice and discovered it says "Smog Certification Required at a STAR Station". No need to panic. All this means is that the DMV has chosen your vehicle to be inspected at a STAR certified smog station which is monitored closely by the BAR and must conform to the high standards established by the Bureau of Automotive Repairs. 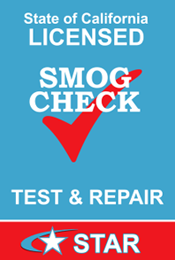 Villa Automotive is a Star Certified Smog Inspection Station and we can take care of your smog certification needs anytime - NO APPOINTMENT NEEDED! The purpose of a brake and lamp inspection is to assure that a vehicle being issued a salvage certificate is in a safe and roadworthy condition prior to being retitled. When you "revive" a salvaged vehicle, either due to accident damage or theft of the vehicle, the California Department of Motor Vehicles considers the ownership of the vehicle to be changed, even though the owner remains the same. DMV requires that a State Licensed Inspection station conduct a thorough and complete examination of these critical components which may have been possibly damaged or misaligned due to an accident or as a result of theft damage. A vehicle may also need such an inspection to correct a defect cited by a law enforcement agency such as the California Highway patrol. This is called a Brake and Lamp Inspection and when successfully completed, a certificate is issued to be presented to the DMV or California Highway Patrol as proof of correction of any cited condition and the safety of the vehicle. The Smog Check program divides the state into three different types of areas depending on the severity of the smog problem in that area. These areas, Enhanced, Basic, and Change-of-Ownership Areas, may require different Smog Check inspection equipment and different licenses. The area in which a vehicle is registered will determine which type of test a vehicle needs; the area in which a station is located will determine which licenses the technician needs to possess and what equipment a station must have to test vehicles in its area. The ZIP Code locator function on this www site can be used to determine in which type of area a station is located or a vehicle is registered. Enhanced Areas: These areas do not meet federal or state air quality standards for ozone and carbon monoxide and are California's smoggiest urbanized areas. Biennial Smog Checks are required here. Fifteen percent (15%) of the vehicles in these areas must have their biennial Smog Checks performed at Test-Only stations. Basic Areas: Vehicles in these less-smoggy areas must have biennial testing at licensed test-and-repair stations. Change of Ownership Areas: These more rural areas of the state require emissions testing only when a vehicle changes ownership or are registered for the first time in California. New Equipment in Enhanced Areas: Enhanced Area stations use new equipment called the BAR-97 Emissions Inspection System (EIS), which uses a treadmill-like device called a dynamometer to simulate actual driving conditions. BAR-97 measures oxides of nitrogen (NOx), hydrocarbons (HC), and carbon monoxide (CO). Large trucks, some four-wheel drive vehicles, and some vehicles with traction control will continue to receive BAR-90 inspections.BAR-90: Vehicles registered in Basic and Change of Ownership Areas continue to be tested on a BAR-90 system that performs a 2-speed idle test which identifies HC and CO levels only.